While the weather is snowy and cold and watching the snow drifts get higher and higher. 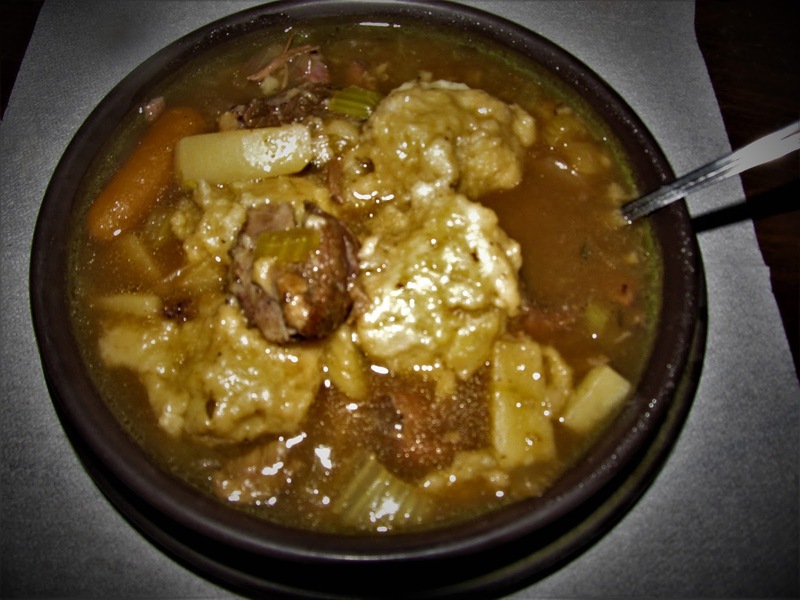 I decided to make this Beef Soup with Dumplings which was perfect for the family. This is my slow cooked method. So on those cold days this soup would be perfect. – Cut up the the celery, carrots, onion and garlic. – In slow cooker , add the Stock, Broth. – Once the Soup bones are done browning, add to slow cooker with the juices. Add the garlic and onion and the spices. Allow to cook on high for an hour. – Turn the heat down to medium, or 3. – After an hour and a half of cooking, Add the carrots, celery ,and potatoes. – You may have to adjust the salt a bit because in my house hold we are watching the salt intake. – Add these wonderful and light dumplings, A half hour before serving. – In medium sized bowl, add all dry ingredients. – Stir in the butter, milk, and egg. – Using a cookie scoop, spoon onto hot soup. (make sure you take out the bay leaves and the thyme). – After spooning in the mixture, put the cover back on slow cooker and cook another 30 minutes. * Any vegetables would be perfect for this soup. What would be good add- ins? Hey, I am Jeanne, from my brand new website “A Jeanne in the Kitchen”, at ajeanneinthekitchen.com. I like your website too, but I cannot see how I can start following you. Like you, I always love learning new things and sharing ideas. I love dumplings! This looks amazing and I think I may have to try this during our ‘soup does the body good’ series in operation ‘feel good’! 🙂 Thanks for sharing! you are welcome and i look forward to seeing that series “Feel Good”. Just let me know. Thank you. I look forward to hearing your thoughts. Sounds wonderful! Thyme imparts a wonderful flavor to beef! I love hearty soups! Sounds like a great comfort food. Hope to try it soon. This is a very interesting recipe which reminds me of my grandmother Kay’s dumplings 🥟 Thank you for sharing!